Opening paragraph of the treatise On Fate (Peri eimarmenes) by Alexander of Aphrodisias dedictaed to Emperors (autokratoras). From an anonymous edition published in 1658. Alexander of Aphrodisias (Greek: Ἀλέξανδρος ὁ Ἀφροδισιεύς; fl. 200 AD) was a Peripatetic philosopher and the most celebrated of the Ancient Greek commentators on the writings of Aristotle. He was a native of Aphrodisias in Caria, and lived and taught in Athens at the beginning of the 3rd century, where he held a position as head of the Peripatetic school. He wrote many commentaries on the works of Aristotle, extant are those on the Prior Analytics, Topics, Meteorology, Sense and Sensibilia, and Metaphysics. Several original treatises also survive, and include a work On Fate, in which he argues against the Stoic doctrine of necessity; and one On the Soul. His commentaries on Aristotle were considered so useful that he was styled, by way of pre-eminence, "the commentator" (ὁ ἐξηγητής). On Fate is a treatise in which Alexander argues against the Stoic doctrine of necessity. In On Fate Alexander denied three things - necessity (Greek: ἀνάγκη), the foreknowledge of fated events that was part of the Stoic identification of God and Nature, and determinism in the sense of a sequence of causes that was laid down beforehand (Greek: προκαταβεβλημένα αἴτια) or predetermined by antecedents (Greek: προηγούμενα αἴτια). He defended a view of moral responsibility we would call libertarianism today. By the 6th century Alexander's commentaries on Aristotle were considered so useful that he was referred to as "the commentator" (Greek: ὁ ἐξηγητής). His commentaries were greatly esteemed among the Arabs, who translated many of them, and he is heavily quoted by Maimonides. ^ Pierre Thillet, in his 1984 Budé edition of On Fate, has argued against Moraux's identification (Der Aristotelismus im I. und II. Jahrhundert n. Chr., vol. 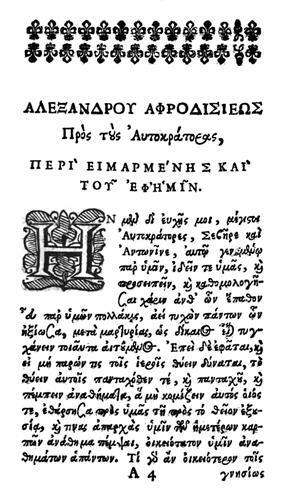 2, 1984) of Aristotle of Mytilene as Alexander's teacher, pointing out that the text that has been taken to mean this (On Fate, mantissa, p. 110.4 Bruns, Ἤκουσα...παρὰ Ἀριστοτέλους) could refer instead to Alexander's learning from the texts of Aristotle the Stagirite. See R.W. Sharples, Classical Review, n.s., 36 (1986), p. 33. Cyril of Alexandria, Against Julian 2.38, may name Aristocles of Messene, but the text edited by Burguière and Évieux (Sources Chrétiennes 322, 1985) reads Ἀλέξανδρος ὁ Ἀριστοτέλους μαθητὴς. ^ "The two books of the De Anima differ markedly in form and content, and they were not originally a single work. Book I is generally recognized as authentic. Book II is almost certainly not by Alexander of Aphrodisias in its present form, though much of the material may be his or from his school."